Designed to work with all popular USB powered devices from iPhones to Android phones, tablets & iPads, photography gear, Bluetooth speakers, headphones and more. Whatever USB powered gear you've got, we've got you covered. • Intelligent Charging Technology: Automatically recognizes your devices and maximizes charging efficiency. Charge all USB powered devices at safest maximum speed. Get a full charge in half the time. • Safe and Sturdy Design: Built-in premium circuitry and microchip protect your devices against excessive current, overheating, and overcharging. • Lightweight & Compact: The portable design makes this charger ideal for worldwide travel. Mulit-ports allow you to charge up to 4 devices at once. 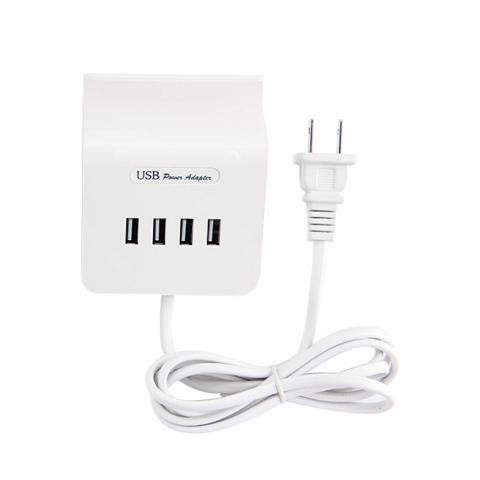 • Universal Compatibility: Charge any USB device, features optional AC plug. Ideal for iPhone & Android, tablets & iPad, audio and photography gear. Purchased 4 of these to place at various locations throughout my house, like beside my bed and in my family room where devices commonly find themselves sitting and needing a charge. Work great as advertised. Unit is deep so in the gang boxes where I had a lot of wires, wire management was necessary to house everything safely inside the gang box. Given the big box stores want $30 for 1, and these are 2 from $30 and UL Cert I'm very happy with my purchase. It does the job, it's not as fast as the original iPad 4 charger but it's close. I tried charging two big iPads and two HTC smartphones at the same time and it works just fine. My HTC One S though, it reports USB speed charging (500mA) instead of full speed 1Amp but then again I haven't yet found a charger other than the original one that can charge my One S at full speed, and I tried many. I was hoping the smart chip would do the trick, but no luck. I agree with another reviewer here that got this for free, that it should include the wall plate for this price. So happy I purchased this! Needed a multi-port charger but didn’t want to pay a whole lot. This works great. I like that the light goes on to let you know it’s actually charging and the fact that it can stand up is a bonus. You can remove the piece on the bottom if you don’t want it to stand up which has come in handy too. The cord is very thick and durable. It’s not a flimsy cheap cord which a lot of these no name chargers are. I will update if it should stop working but I don’t foresee any problems with this one. I bought 2 as gifts for Christmas. Then I decided I wanted a couple. I now have one by my nightstand and can charge my phone and tablet at the same time. I also have one in the kitchen. These work very well and extremely easy to install. Takes 2 minutes! I will be buying more. I highly recommend this it has a cord so when you go to plug it in you don’t have to crawl around in your hands and knees plugging in your phone later plenty of room for tablets And other devices it has a switch so you can turn it off if you wish and a lighter to let you know that the switch is on. So convenient! I have so many things that require USB ports for charging, and I was trying to fit a bunch of adapters on a power strip- a real mess! This solved the problem, everything fits nicely. The only thing I'll mention is the blue indicator light is REALLY bright- in my bedroom it was a bit much- I tucked it under furniture to lessen the brightness. I use this at home and really like it, but it's amazing for traveling. It's light, so not weighing down my backpack and charges my smart phone, smart watch and headset all at the same time. With the stand, it's very easy to set on the bedside table in a hotel. I'd definitely buy it again.